CHICAGO – On a cold day in January, it was a “Cold War” night. 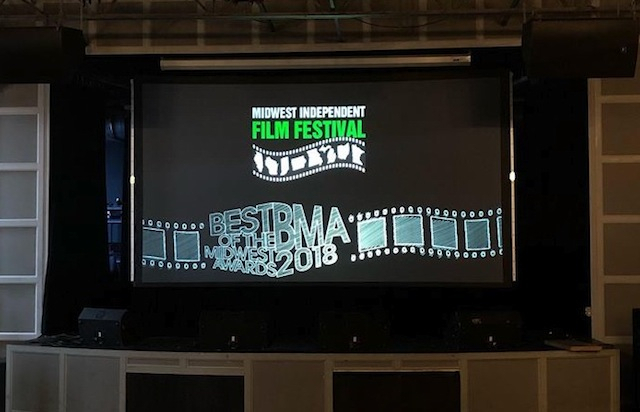 The Midwest Independent Film Festival “Best of the Midwest” (BMA) Awards for 2018 were given out on January 17th, 2019, and “Cold War” took home three major honors, including Best Feature. The shot-in-Chicago indie film also won Best Director (J. Wilder Konschak and Stirling McLaughlin) and Best Actor (Michael Blaiklock). The Best Actress was Clare Cooney in her excellent short “Runner.” (also Best Short Film). The BMA Awards were hosted by Executive Director Amy Guth at the The Promontory in Hyde Park, Chicago. The votes were tallied from internet survey and the Midwest Indie Awards Committee, and capped off a year of transition for the Festival, as Amy Guth took the reins as Executive Director in July. The breezy film-community-oriented night had a energetic vibe at The Promontory, with sponsorships by SAGIndie, Goose Island Brewery and El Nacimiento Hand-Crafted Tequila. The soundtrack for the evening was provided by renown DJ Ca$hEra. The Midwest Independent Film Festival is a year-round movie event in Chicago that takes place the first Tuesday of every month, at the Landmark Century Centre Cinema. The festival has been recognized by Chicago Magazine in their “Best of Chicago” issue, and has become one of the top places for local filmmakers, producers and actors to network in the city. Patrick McDonald of HollywoodChicago.com participates on the Awards Committee and presented the BMA for Best Documentary Short. The honorees for the 2018 “Best of the Midwest” Awards are as follows…. For the HollywoodChicago.com interview of Clare Cooney, click here. For the HollywoodChicago.com interview of J. Wilder Konschak and Stirling McLaughlin of COLD WAR click here. The Midwest Independent Film Festival, which is presented every First Tuesday of the month, upcoming in 2019. For more information about the festival, click here.